In Buenos Aires I used to receive letters from homosexual persons who are “socially wounded” because they tell me that they feel like the church has always condemned them. But the church does not want to do this. During the return flight from Rio de Janeiro, I said that if a homosexual person is of good will and is in search of God, I am no one to judge. By saying this, I said what the catechism says. Religion has the right to express its opinion in the service of the people, but God in creation has set us free: it is not possible to interfere spiritually in the life of a person. We cannot insist only on issues related to abortion, gay marriage and the use of contraceptive methods. This is not possible. I have not spoken much about these things, and I was reprimanded for that. But when we speak about these issues, we have to talk about them in a context. The teaching of the church, for that matter, is clear and I am a son of the church, but it is not necessary to talk about these issues all the time… We have to find a new balance; otherwise even the moral edifice of the church is likely to fall like a house of cards, losing the freshness and fragrance of the Gospel. … The proclamation of the saving love of God comes before moral and religious imperatives. Today sometimes it seems that the opposite order is prevailing. The responses have been, predictably, wide-ranging from the outraged, to the relieved. Many Catholics feel that, for the first time in maybe forever, they have a pope who shares their vision for the role of the church. Many more still feel that it is opening the door to the concepts and groups they’ve long hidden from within the walls of the church. 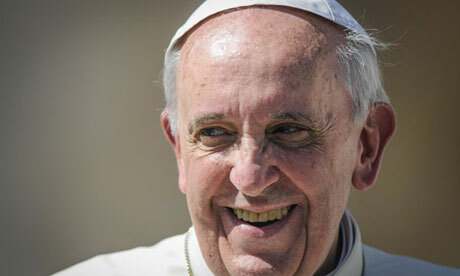 But what of the groups Pope Francis is speaking of (and perhaps to)? What do women, gay people, and the countless other groups whose lives have been maligned as somehow offensive and who have been actively denied whatever comforts belonging to the church brings? What of those the church has made de facto enemies of? How impressed are they with the brand new sheriff? I am wary of a solution that can be reduced to a kind of “female machismo,” because a woman has a different makeup than a man. But what I hear about the role of women is often inspired by an ideology of machismo. Women are asking deep questions that must be addressed. The church cannot be herself without the woman and her role. The woman is essential for the church. … We have to work harder to develop a profound theology of the woman. Only by making this step will it be possible to better reflect on their function within the church. The feminine genius is needed wherever we make important decisions. The challenge today is this: to think about the specific place of women also in those places where the authority of the church is exercised for various areas of the church. Why, in the year 2013, are we still talking about women’s places, as if there isn’t a vibrant women’s leadership that has actively taken up a place where none was offered? Rather than listening to the existing “profound theology of the woman” coming from women leaders within his own church, he spouts some very problematic arguments that seem to reduce the calls for women to be ordained as priests, to be considered for election to the papacy is as “machismo”. How about a conversation about why men in this church are threatened enough by women that they will not engage in conversations led by women in the church? And for all of his talk about the church as body of hope, rather than a legal, regulatory institution, little is said about the very real pain caused to people who have felt the brunt of a church that tries to dictate their lived experiences. When I was younger, I was angrier at the church for all of the wrongs it has done to others, and to me. I remember when, after a protracted televised death watch, Pope John Paul II died, telling my father I was pleased. “Good – I’m glad”, I said, to my very shocked dad. All I knew of the pope is that he headed up an institution that had hurt and continues to hurt a lot of people in a lot of different, deep ways. I suppose on some level, I thought that had something to do with him as an individual. I’m older, and (somewhat) less angry, and I know that the sins of an institution can’t possibly come down to one person. But it means something, I think, that the individual currently speaking on behalf of and to an institution chooses to call out some of its most repugnant dogmas. It doesn’t excuse what’s happened in the name of the church and it certainly doesn’t answer many of the questions about what exactly a “new balance” for this church will really look like. But it matters that the conversation can now begin. One of the things I learnt when I was Catholic is that the pope is a serious deal for members of the church: he is a father figure, and arbiter, a direct connection to god. The papacy provides the spiritual direction, and is one of the central identity markers of the church. The institution doesn’t come down to one individual, but what this one individual says is significant to this institution. 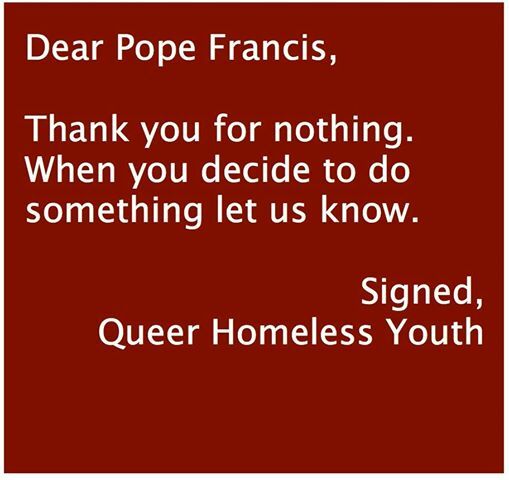 So, Pope Francis’s thoughts are an important step. Whether or not they will be a first step in much-needed transformation of the church, however, remains to be seen.